Kelly Sullivan, a New Jersey native and pioneer in the field of collaborative art, has used her talents to inspire imagination and action in girls around the world through her Mighty Fingers Facing Change Project (MFFC). Sponsored by NJEA, Sullivan recently brought this powerful production to five New Jersey schools. 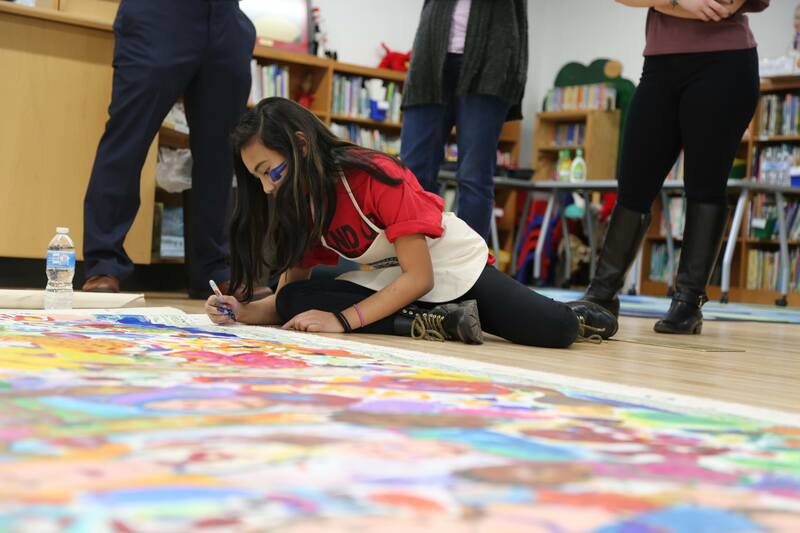 The MFFC project includes creating a “super-self-portrait” and participating in a collaborative 10-foot FingerSmear® painting that Sullivan brought to each location for all of the students to participate in. New Jersey is not the only place Sullivan has worked. She has produced MFFC in 18 locations around the world including Uganda, Haiti, India, Guatemala, Spain and others. She is headed for China this month. “We inspire young people to become explorers, and pilot their own ships, knowing that the currents may change,” Sullivan says. NJEA Organizational Development staff person Michael Saffran visited Sullivan’s studio in Lambertville by chance and was struck by the impact of her work. At the 2017 SLC, thousands of members finger painted an image that combined NJEA’s core values of unity, pride, excellence, the value of universal public education, and diversity. That FingerSmear® was featured on the cover of the October 2017 NJEA Review with now-Gov. Phil Murphy. 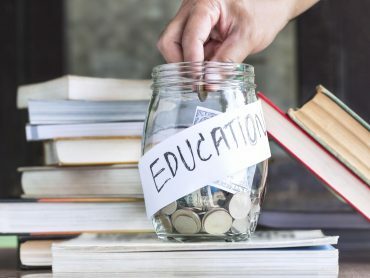 But at the same time, Saffran and Sullivan wanted to develop a program that brought Mighty Fingers Facing Change to as many students as possible. Working with NJEA Communications staffer Christy Kanaby, they developed guidelines and a budget to maximize the impact of the program. At SLC, Sullivan presented three electives to members about the program and members were encouraged to apply to win a visit from Sullivan. In October, schools in Absecon, Jersey City, Hillsborough, Clinton, and Hamilton Township (Mercer County) were selected. Beginning in early February, Sullivan, her assistant Becka Warfel, Saffran and other NJEA staff descended on the schools armed with acrylic paint, paper bags and bundles of Handi Wipes. Richard C. Crockett Middle School, Hamilton Twp. As she would at each of the schools, Sullivan faced a quiet, uncertain group of 25 students at the beginning of her presentation. And, as she would see repeated at each school, by the end of the day, the students were laughing, engaged, and a little paint-splattered. Sullivan would share her story about how art changed her life and how allowing oneself to be creative actually changes the brain. She encouraged the students to share what makes them unique. 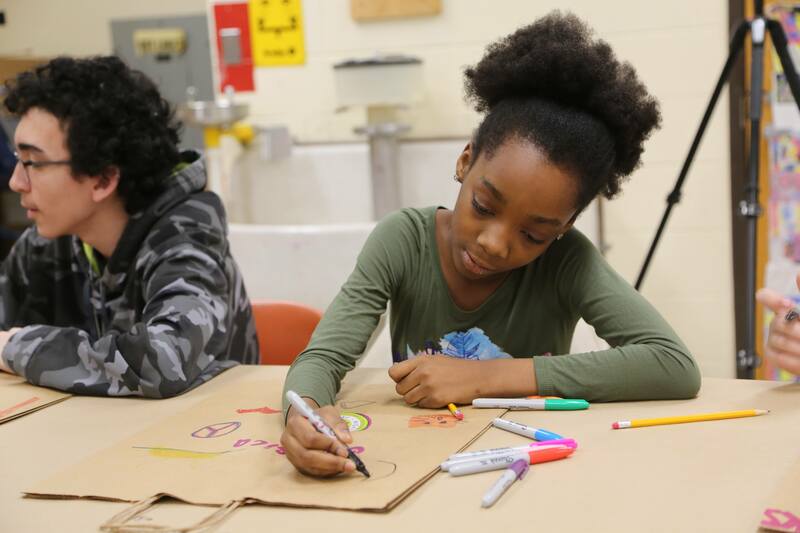 Beginning with one side of a large brown paper bag, Sullivan guided the students through a visualization exercise that had them use markers to draw symbols and words that expressed themselves and their ideas. Student conversations ranged from discussing a chosen symbol that represented their character to sharing thoughts on the struggles they and their peers face in reaching their goals. They were asked about changes they would like to see in the world, and what kind of messages they would like to deliver to the district’s administration, the nation’s leaders, or girls on the other side of the world. The students also had an opportunity to participate in “Abundance,” a FingerSmear® that has traveled around the world with Sullivan to all of the MFFC locations. In addition to the tactile experience of a FingerSmear, Sullivan also introduced the students to http://paint.team-an online, collaborative digital painting application developed by Sullivan and her partner Doug Moreland. 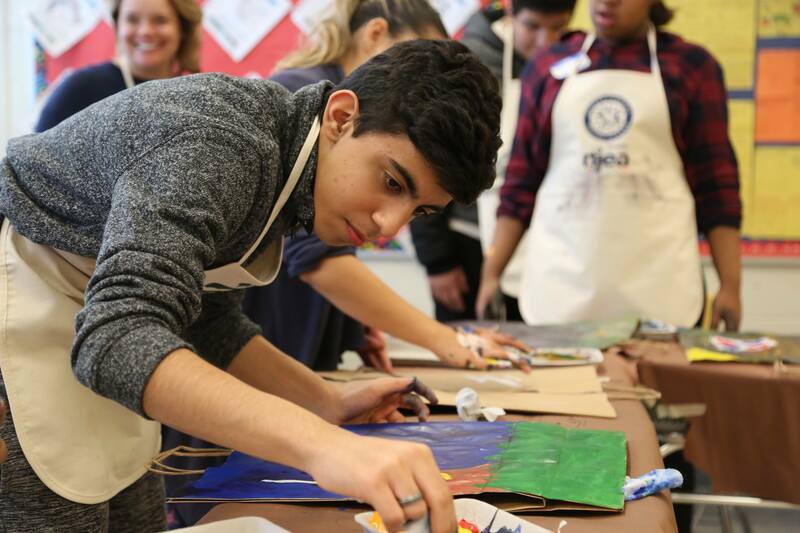 Following lunch, which was provided by the Absecon Education Association through an NJEA PRIDE in Public Education grant, the students got down to work with the paint, and the results were powerful. At the end of the day, each student stood in front of the room, presented his or her painting, and completed the sentence, “With my Mighty Fingers, I will…” Students shared their professional and personal goals and loudly applauded their classmates. The students in Emily Litman’s class are English language learners who have recently arrived in the United States from Spanish-speaking countries. As a result, Litman and her colleagues, co-teacher Isela Brenes, and assistants Maria Torres and Virginia Osorio, spent a busy day translating for Sullivan as she led the students through the program. But the end result was powerful for everyone involved. The Jersey City Education Association provided a lunch of pulled pork, fried chicken, beans, rice, and fried plantains prepared by the mother of two students in the class. In addition, students proudly shared homemade desserts from their countries of origin. 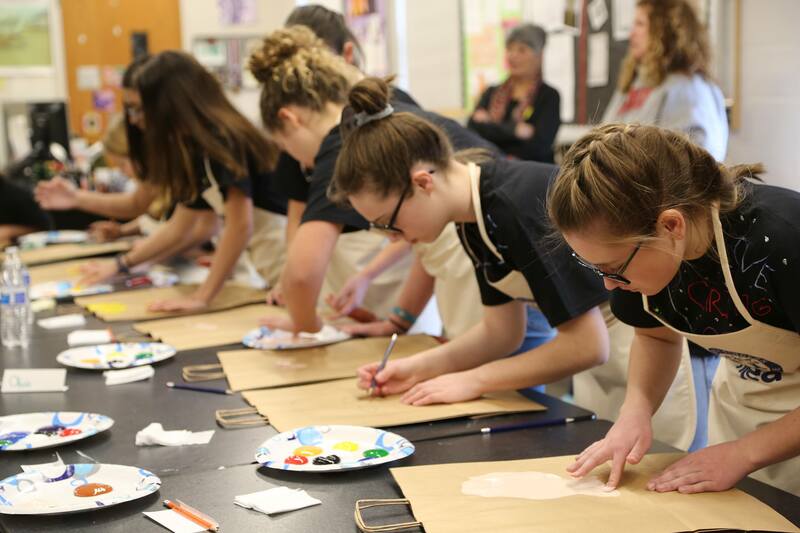 Litman, like almost all of the other teachers, will host an event so that the students’ families and the community can enjoy the art the students created. In addition, students will be able to share their experience with paint.team. 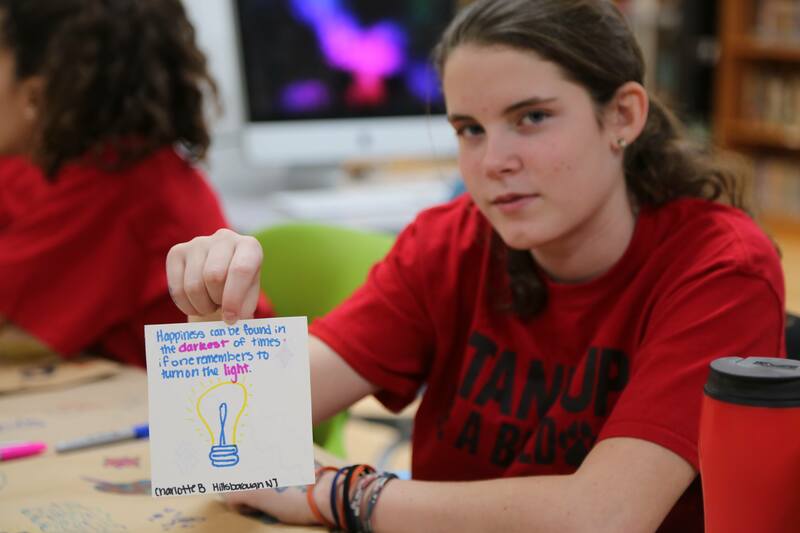 Sullivan has created a school-specific design for each of the participating schools that can be shared with the other students, enabling the original art students to become guides for their classmates. 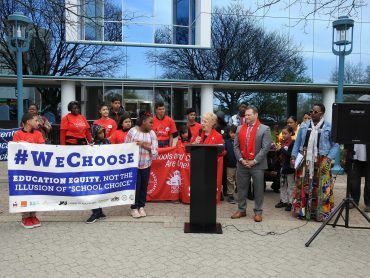 Physical education teacher Regina Kay applied for the program because she wanted to show her students that despite coming from diverse cultural and economic backgrounds, they really shared many of the same values, interests, hopes and dreams. Kay had praise for the work Sullivan is doing to empower and encourage students. “Kelly and her staff were amazing! They led the girls through a variety of activities that allowed for not only a chance for the girls to express themselves creatively, but also an opportunity to reflect on their lives and the impact they want to have on the world,” Kay said. Clinton holds special meaning for Sullivan, who had her first art lesson at a local studio there. 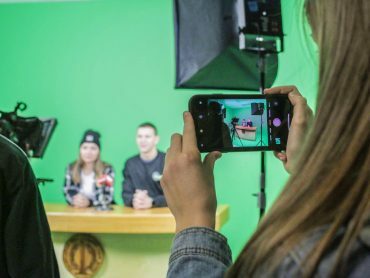 The school selected all girls to participate and NJEA’s Emmy-award winning show, “Classroom Close-up NJ,” filmed the event and interviewed students and staff about the project. That episode will air May 20 and June 17 on NJTV. It will also be available online once it airs at classroomcloseup.org. At the final school, both boys and girls crowded around the art tables in Lora Durr’s classroom. Hamilton is also a culturally and economically diverse community that borders Trenton. 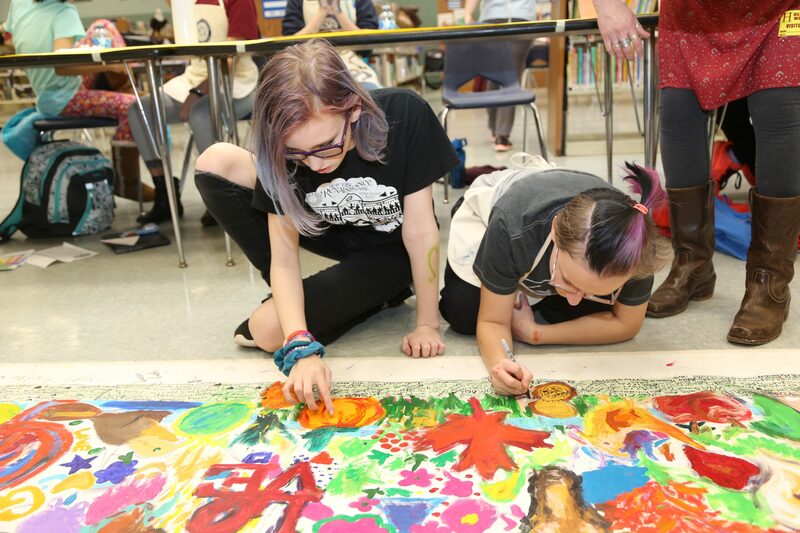 “The students brought a variety of experiences and talents to the project and the resulting art work was a beautiful way to complete this phase of the project,” Sullivan said. Going forward, Sullivan is hoping to attend the parent and community nights at the schools to see the students proudly share their art work. In addition, each school will share and complete its paint.team project. For more information about Sullivan’s work, go to mightyfingersfacingchange.com. Kathryn Coulibaly is the associate editor of the NJEA Review and provides content and support to njea.org.